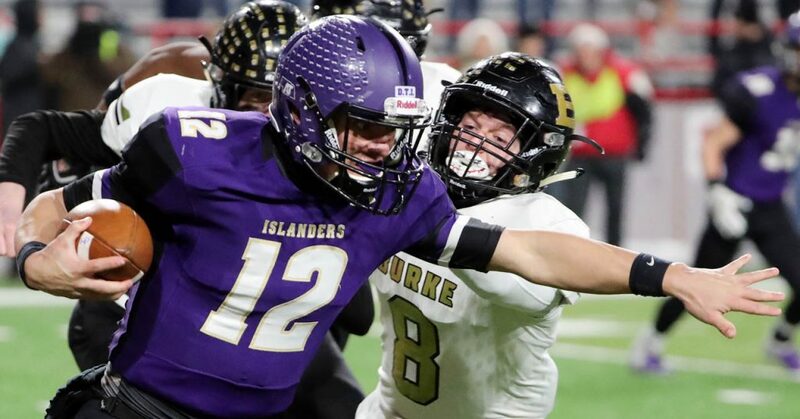 Grand Island senior quarterback Cole Evans protects the ball while running by Omaha Burke senior linebacker Creighton Kimnach (8) during the Class A Nebraska State High School Football Championship at Memorial Stadium in Lincoln Monday night. Omaha Burke junior Xavier Watts catches a long pass for a touchdown against Grand Island junior cornerback Ace McKinnis during the Class A Nebraska State High School Football Championship at Memorial Stadium in Lincoln Monday night. 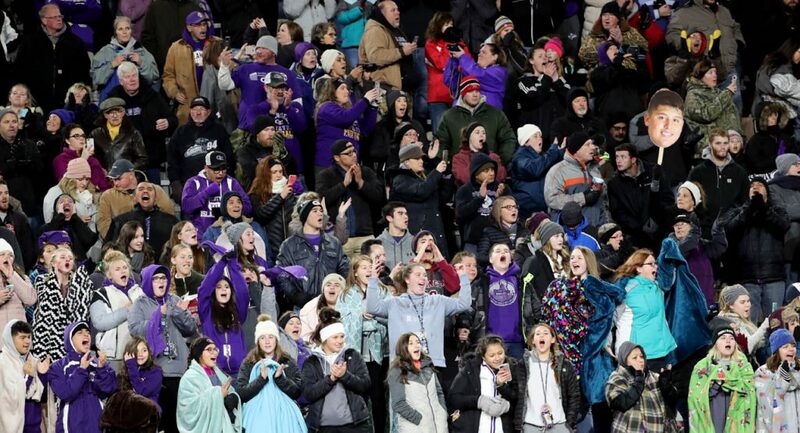 Grand Island fans cheer during the introduction of players during the Class A Nebraska State High School Football Championship against Omaha Burke at Memorial Stadium in Lincoln Monday night. Omaha Burke senior Christopher Hickman stands with an American flag draped over his shoulders during the playing of the National Anthem during the Class A Nebraska State High School Football Championship against Grand Island at Memorial Stadium in Lincoln Monday night. 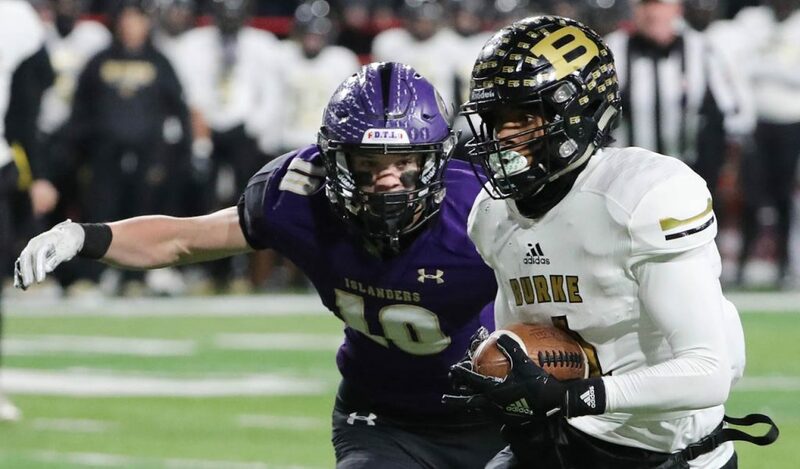 Omaha Burke junior defensive back Xavier Watts, left, breaks up a pass play to Grand Island junior wide receiver Broc Douglass during the Class A Nebraska State High School Football Championship game at Memorial Stadium in Lincoln Monday night. 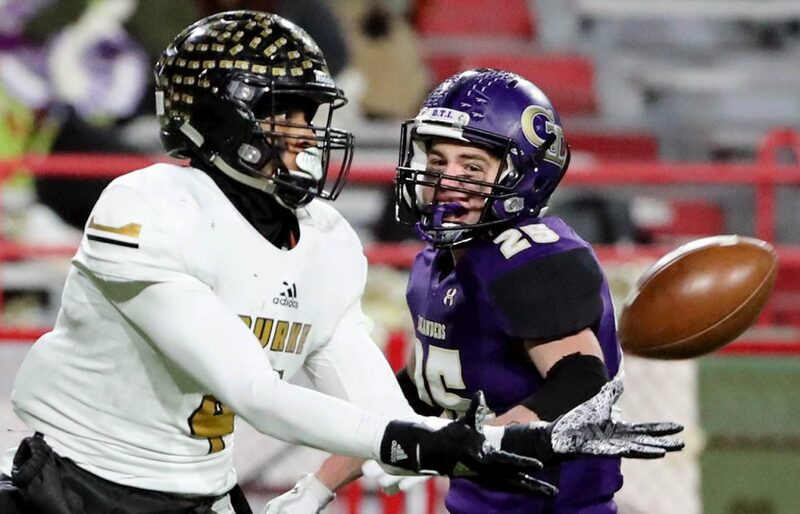 Grand Island junior linebacker Caleb Franci is in pursuit of junior wide receiver Xavier Watts during the Class A Nebraska State High School Football Championship against Grand Island at Memorial Stadium in Lincoln Monday night. 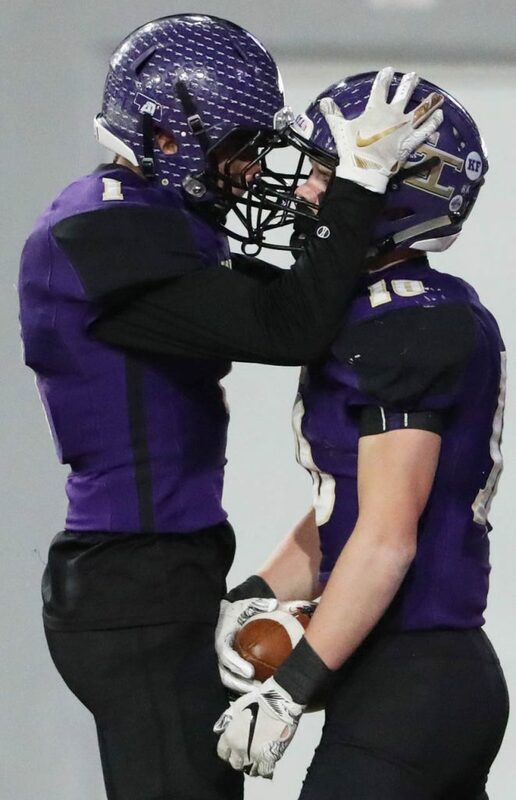 Grand Islands Broc Douglass, left, celebrates Caleb Franci’s touchdown catch during the Class A Nebraska State High School Football Championship against Omaha Burke at Memorial Stadium in Lincoln Monday night. 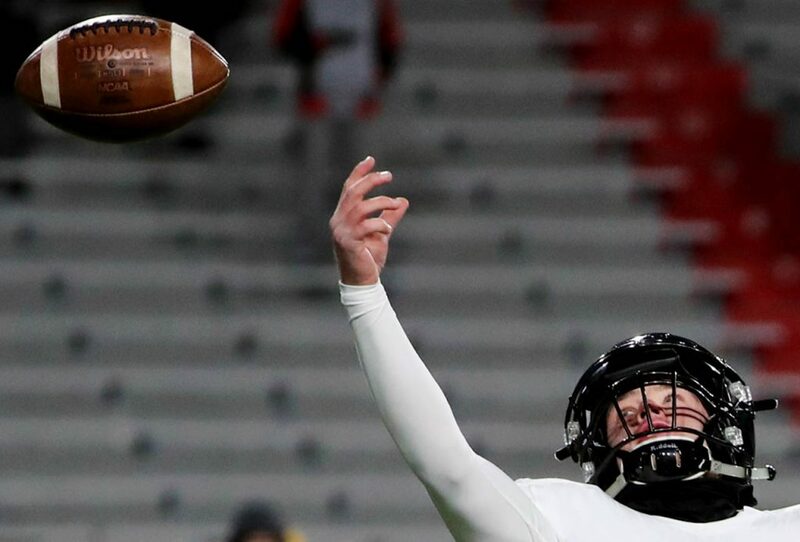 The ball sails over the head of Omaha Burke senior punter Colin Campin on a high snap against Grand Island during the Class A Nebraska State High School Football Championship at Memorial Stadium in Lincoln Monday night. 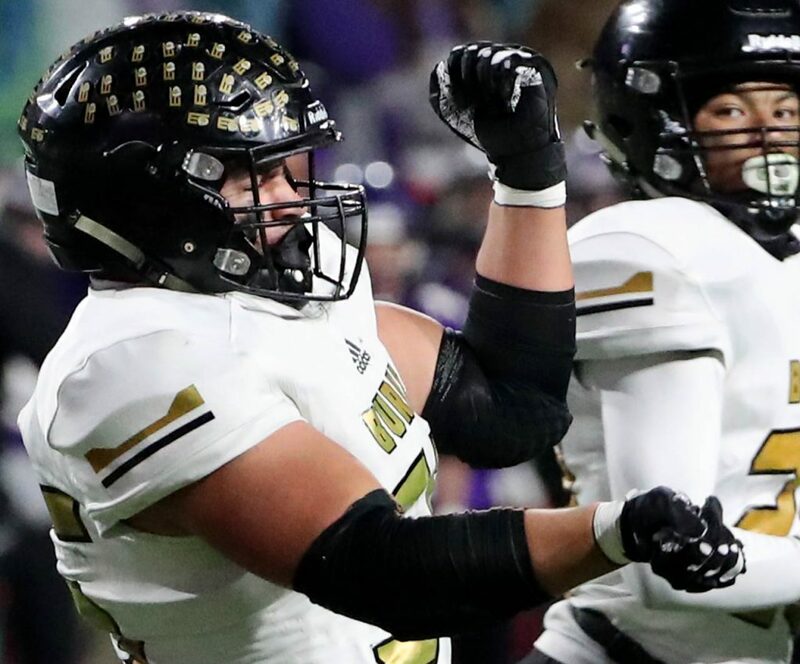 Omaha Burke senior defensive tackle Hunter Jones celebrates a turnover on downs against Grand Island during the Class A Nebraska State High School Football Championship at Memorial Stadium in Lincoln Monday night. 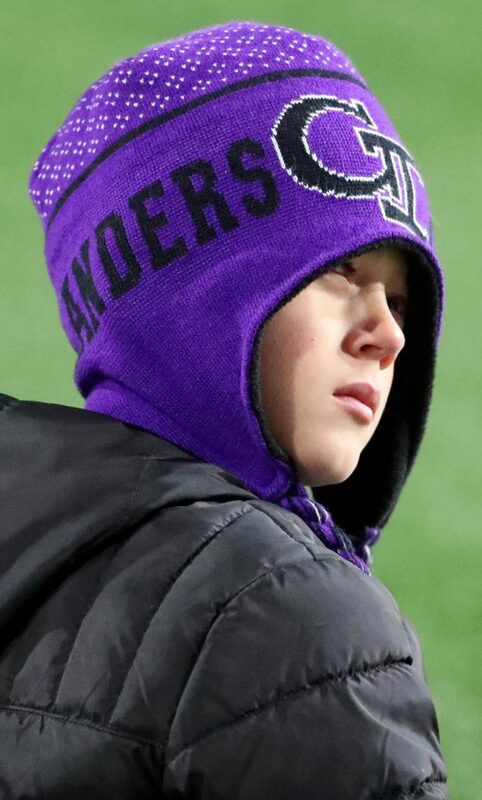 A young fan looks at the replay on the Memorial Stadium scoreboard during the Class A Nebraska State High School Football Championship game Monday night. 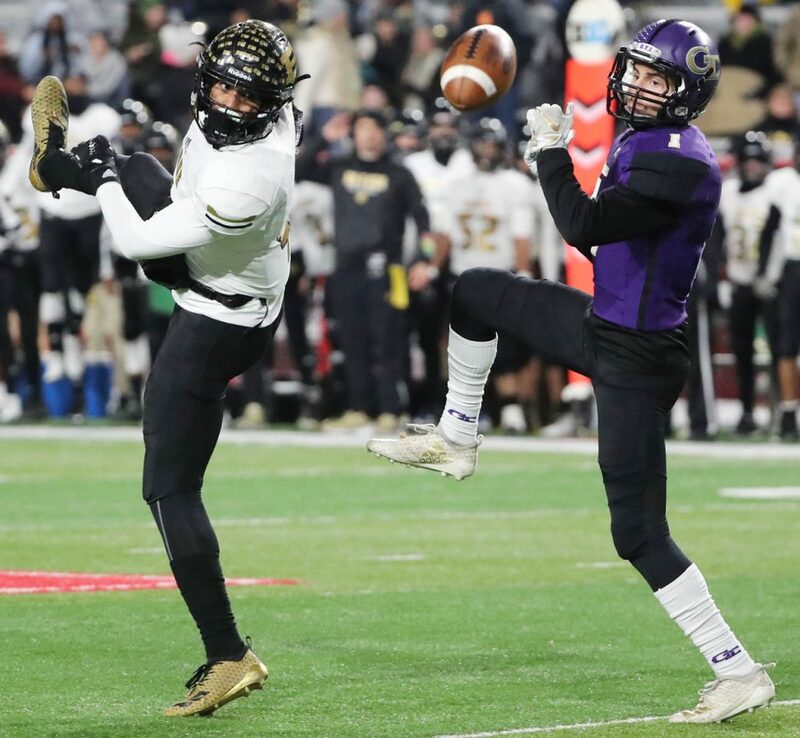 Grand Island senior Sam Sims tries to block the pass of Omaha Burke senior quarterback Tyler Chadwick during the Class A Nebraska State High School Football Championship game at Memorial Stadium in Lincoln Monday night. 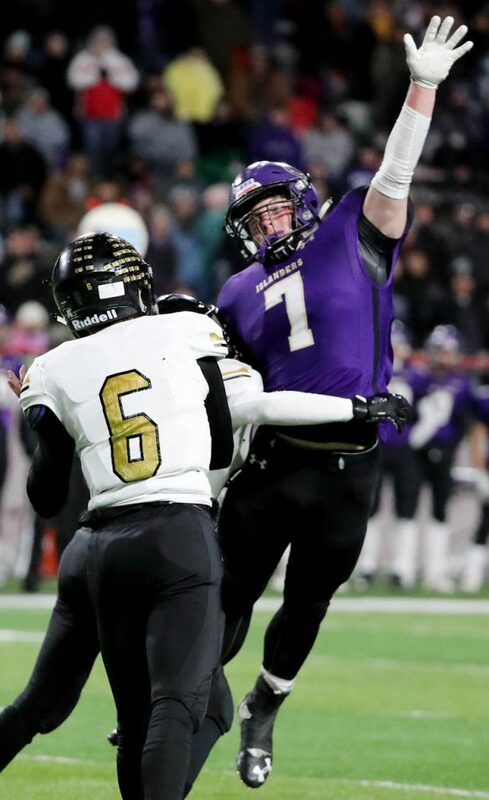 Grand Island senior Jake Wemhoff, right, celebrates tackling an Omaha Burke player during the Class A Nebraska State High School Football Championship game at Memorial Stadium in Lincoln Monday night. 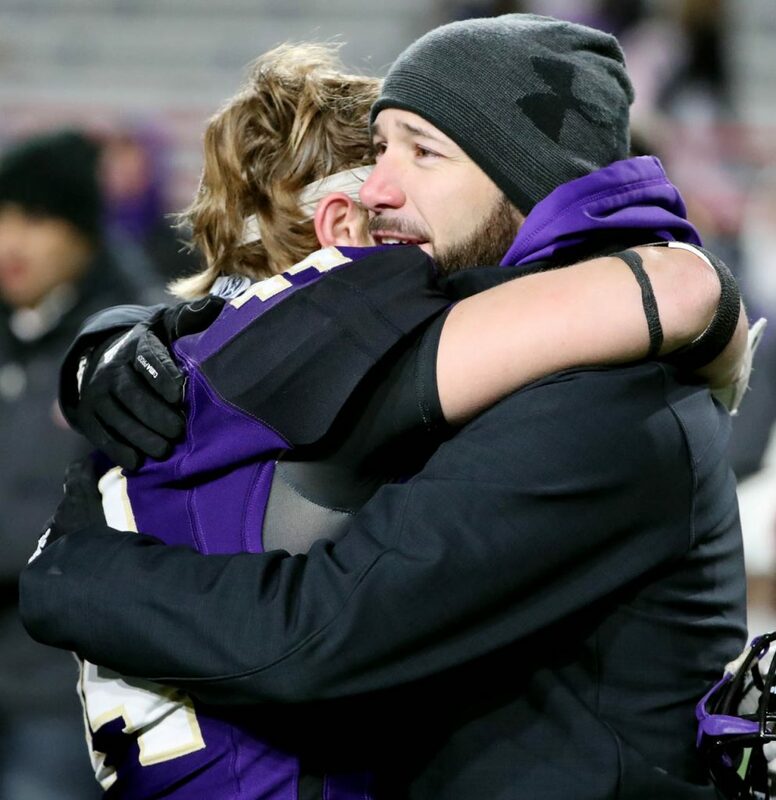 Grand Island senior Jake Wemhoff hugs a coach as the Islanders lose to Omaha Burke 24-20 in the Class A Nebraska State High School Football Championship at Memorial Stadium in Lincoln Monday night.